The Aston Martin DBX Concept hints at the look of the supercar maker's future crossover. 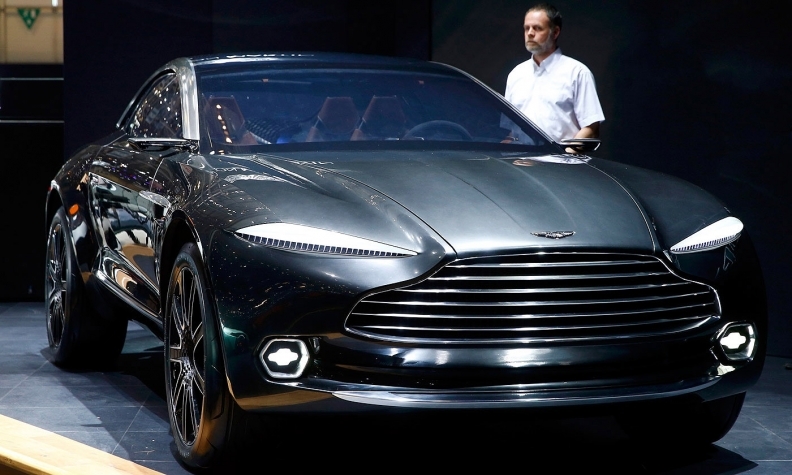 GENEVA (Reuters) -- Aston Martin today announced plans for an SUV-styled crossover that may draw more heavily on its partnership with Daimler, as the UK supercar maker confirmed moves to raise more capital and expand into new vehicle categories. Aston has secured about 150 million pounds ($230 million) in additional funding, CEO Andy Palmer said at the Geneva auto show. Aston's main shareholders, private equity groups Investindustrial and Investment Dar of Kuwait, have agreed to back the capital hike and range expansion, Palmer said. He said the SUV could use a four-wheel-drive architecture from Daimler, which is already supplying Aston with electronics and V-8 engines from its AMG performance division under a 2013 deal. "It is not ruled out, nor is it agreed," Palmer said, without elaborating. A Daimler spokesman declined to comment. The cash injection will enable Aston to hit a "consistently sustainable" level of spending on new models, Palmer said. The new investment is in addition to 500 million pounds already earmarked for a revamp of the brand's core lineup. Held back by aging models and weak investment, Aston has missed out on a global luxury car boom that helped Rolls-Royce, Lamborghini, Maserati and Bentley all set new sales records in 2014. Last year Aston delivered 4,000 cars, far short of its 7,300 record in 2007. Palmer said Aston would cap its annual sales at 7,000 units a year to ensure that demand was always more than supply. In a departure from its pure sports car heritage, Aston is going ahead with four-door luxury sedans under a revived Lagonda badge as well as the SUV to increase its appeal to younger consumers and women. "The reality is that we have to expand our customer base, we have to address the issue of our (CO2) emissions and we have to appeal to a generation of kids who have grown up with SUVs, particularly in places like China," Palmer said. Aston today unveiled the DBX Concept, a potential all-electric, all-wheel-drive grand tourer whose design hints at the supercar maker's future crossover. Palmer said the concept was not a production-ready sports GT, but "a piece of fresh, bold thinking about what Aston Martin GT customers around the world could request of us in the future."